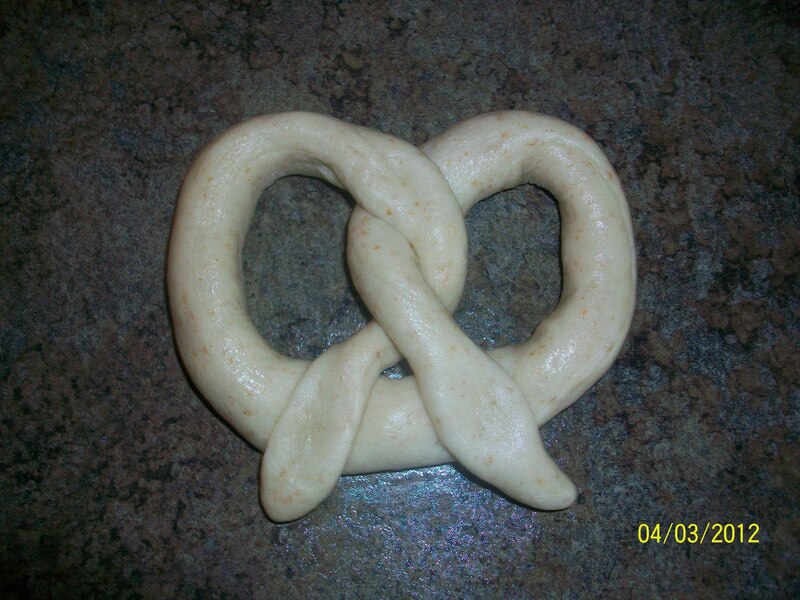 Kitchen Friend Heidi Kleyn from Vicksburg, MI came up with this fabulous soft pretzel recipe using your 1 cup of Amish Friendship Bread starter. This is a great way to use any leftover starter, or if you’re looking for something fun to serve on Super Bowl Sunday. “Make a tasty dipping sauce with half mustard and half mayo,” Heidi suggests. “These are really great if you eat them warm. Instead of the kosher salt, try topping with sesame seeds, poppy seeds, dried onion or dried garlic.” This recipe can also be used to make breadsticks — just leave them straight instead of twisting into a pretzel-shape. The perfect game day snack! 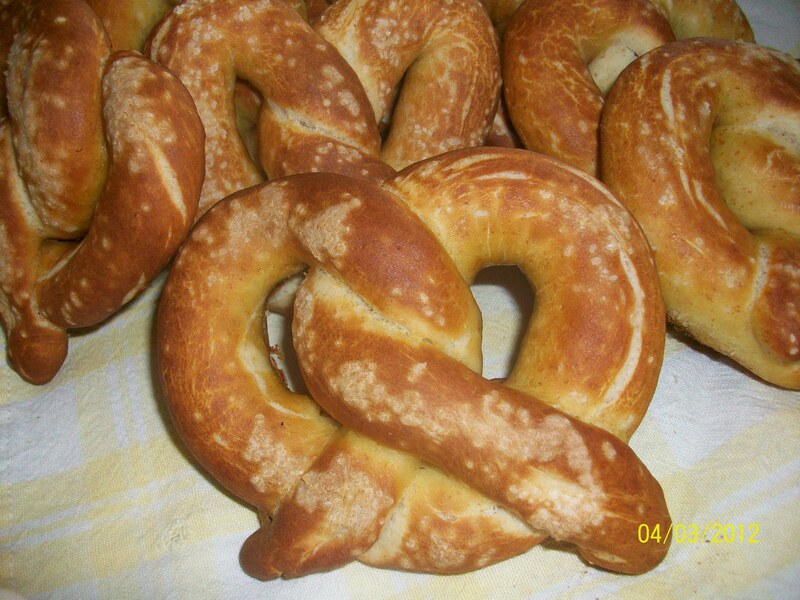 Use your one cup of Amish Friendship Bread starter to make these soft and chewy pretzels. In a stand mixer bowl with dough hook, add starter, water and yeast. Let sit for 5 minutes. Add rest of ingredients into mixer bowl and mix until dough pulls away from the sides and a ball forms. Grease a bowl, put in ball of dough and cover with plastic wrap. Let dough rest and rise for 1 hour. It won't rise very much. Lightly oil work surface and place dough. Roll out each piece to about 20 inches. Use fingers to roll from inside to outside. 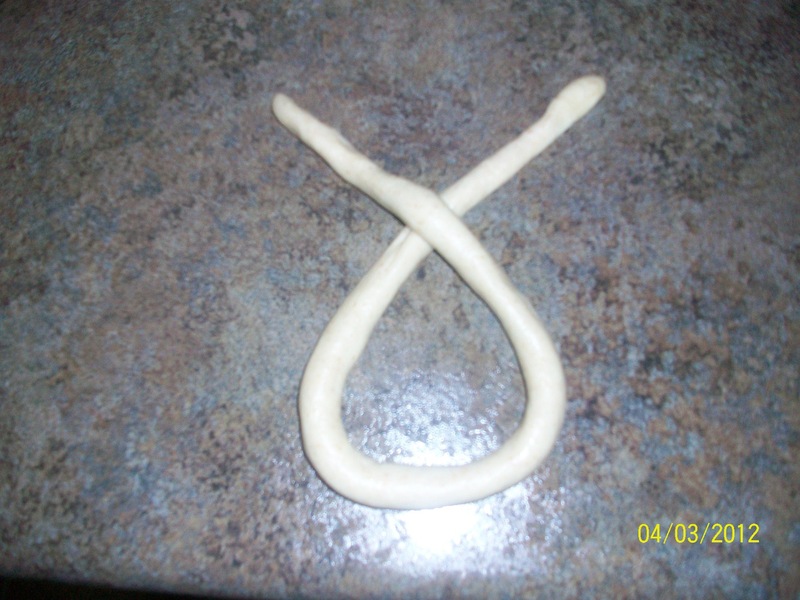 Take dough and make a U-shape and then cross, bringing it down to form a pretzel. Press dough together so it stays together. Get 8 to 10 cups of water and 1 teaspoon of baking soda simmering on the stove top. Place one pretzel at a time in the simmering water for 1 minute. Place pretzels, spaced out on a greased pan and sprinkle with kosher salt. Bake for 18 to 20 minutes, turning and switching the pretzels once during baking. Remove to cooling rack. Bottom of pretzels will be harder and chewier. >> Have you tried this? Share your best pic with us or leave a comment below and let us know how it worked for you!! I love ideas for this starter. I have come up with many different flavors of bread, but have never branched off to any other item. my boys love soft pretzels so this is something I will definitely try! Thank You! I made these today and they are quite delicious! Hubby loved them as well. Igot 18 of them and sprinkled some w/ coarse salt, but it was too much. Do you think you could turn these into bagels? Wow! So good! Who knew? I have never tried making pretzels before and these were super easy and delicious. Can you freeze the pretzels after cooking? Love the options that you can have with the AFB. I too have tried many flavors and variations but would love to try this one. Thanks for the suggestion. These are definitely going in my ‘saved recipes’ folder!! I made these today and they are fantastic. My boys loved them. They have a nice flavor, just a hint of the starter (sough-dough). I do recommend eating them fresh. I hope they taste as good warmed up. I just copied this recipe, and now am off to try it. I love that there are so many savory recipes that use Friendship bread starter! You can’t eat cake every day… Thanks for sharing!! I have been searching for a soft pretzel recipe, def going to be trying this one! These are awesome and the grandboys love to help make them, they don’t always turn out looking like pretzels though. but they sure taste good. This may be a silly question, but on what day of the Friendship Bread Started do you prepare this recipe. Do you run through Days 1-10 and make these on Day 10? Or do you bake these on Day 1? At the first step, do you mix the ingredients together before letting it sit for 5 minutes? Could you make these sweet and with cinnamon & raisins, like AUNTI ANNE’S pretzels? God, I love those pretzels. I can’t go too the mall without indulging at AuntieAnne’s.